The Cuyahoga River drains 813 square miles of Geauga, Portage, Summit and Cuyahoga counties. The U-shaped river flows both south and north over its 100-mile course which ends at Lake Erie just 30 miles from its headwaters. 37 tributaries travel a total of 286 miles into the Cuyahoga. 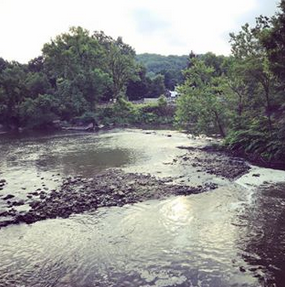 A 25-mile stretch of the Upper Cuyahoga is designated as a state scenic river by the Ohio Department of Natural Resources. The Lower Cuyahoga was part of the first known inland road on the continent. The first Christian church on the river was built by the Delaware Indians and two Moravian missionaries in the mid 1700’s. The Cuyahoga River was the western boundary of the United States from 1795 to 1803. Around 1790, Captain Samuel Brady jumped 22 feet across the Cuyahoga at Kent escaping Indians. Brady Lake in Kent bears his name. The first bridge across the Cuyahoga was built in 1803 at Brady’s Leap. “Standing Rock,” just north of Brady’s Leap in Kent, was an important native American landmark on the river. It was used by various tribes for the exchange of information. Slowdowns at the many locks in the Akron area of the Ohio and Erie Canal were a major factor in the commercial development of the region during the 19th century. Water from the Cuyahoga was diverted to become part of the canal system. The falls for which Cuyahoga Falls is named are currently under the water upstream of the Ohio Edison dam at Gorge Metro Park. During the summer, upwards of two-thirds of the Cuyahoga River’s flow is diverted through Akron’s water supply. Moses Cleaveland, who founded the township of Euclid at the Cuyahoga’s mouth in 1796, left the area in 1797. The first development on Whiskey Island was a liquor still operated by Lorenzo Carter in the early 19th century. Hence, the name. The Cuyahoga River became infamous in 1969 when its surface caught fire. This was not the river’s only incendiary experience. The first occurred in 1936. The navigation channel of the River, which extends from Lake Erie to the turning basin, is 4.5 miles long. A permit from the Ohio EPA is required to discharge anything into the Cuyahoga River. Currently, there are 200 permit holders whose discharge is regulated by the agency’s standards. Drinking water for the City of Akron comes from Lake Rockwell, an impoundment of the Cuyahoga River north of Kent. The City of Cleveland gets drinking water from Lake Erie. The four intakes of this system are located within a nine-mile radius from the mouth of the Cuyahoga River. The treated waste water of millions of residents of Northeast Ohio enters the Cuyahoga. During the century following 1850, the River and its tributaries contributed to the economic growth of Northeastern Ohio by providing industry with water for manufacturing, a means of waste disposal, and an avenue for shipping. During this period, the natural quality of the River was sacrificed. In 1972, Congress passed the Clean Water Act and the Ohio EPA was established. These were major events in the ongoing process of turning around the Crooked River’s water quality problems. In 1974, Congress authorized the Cuyahoga Valley National Recreation Area. The area was designated a National Park on October 11, 2000. Currently, the park occupies a 32,000-acre tract along 22 miles of the River between Akron and Cleveland. In 1985, the International Joint Commission named the lower Cuyahoga River and nearshore areas of Lake Erie as one of 42 Areas of Concern on the Great Lakes. The Ohio EPA became responsible for developing a Remedial Action Plan. In the last 20 years, hundreds of millions of dollars have been spent by industry and government cleaning up the Cuyahoga River. Over 90% of Ohio wetlands have been destroyed, primarily by development and agriculture. Wetlands provide habitat and food for many, many species of animals. The natural dikes and settling ponds of the watershed, they provide no-cost erosion control. Less than 4% of the Cuyahoga’s land area is currently in wetland, mostly in the Upper River. Originally rich with marshes and bogs, the Lower River in Cuyahoga County now has less than 1% of its land area in wetlands. The Ohio Department of Natural Resources preserves 1,361 acres of wetlands in the Upper Cuyahoga Basin. By 1900, after three centuries of thoughtless, unrestricted hunting, beaver were thought to be completely extirpated from the valley. Now they flourish in many areas. Their industrious projects are helping us to replace our valuable wetlands.